Sharpen your trading skills in this trading course. Hou Yifan came along with this course to become a successful trader. 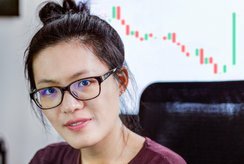 In the first part of this series, she was provided with a very comprehensive starting kit which provided an excellent basic knowledge on the topic of trading. The second part enabled her to dive deeper into the matter and master technical analysis with more self-confidence, with a focus on the most important indicators and chart patterns. This course is complemented by an excursion into the world of fundamental analysis. An insight into the essential aspects of the development of a strategy is given in order to break away from the beginner's strategy, and enable the student to pursue their own path. Hou Yifan utilized this learning plan to take a major step in her education. We are confident that this is also the right action for many other trading beginners.